Perfect 10s and Big Upsets at Billabong Pro Tahiti, Winner Crowned Today! 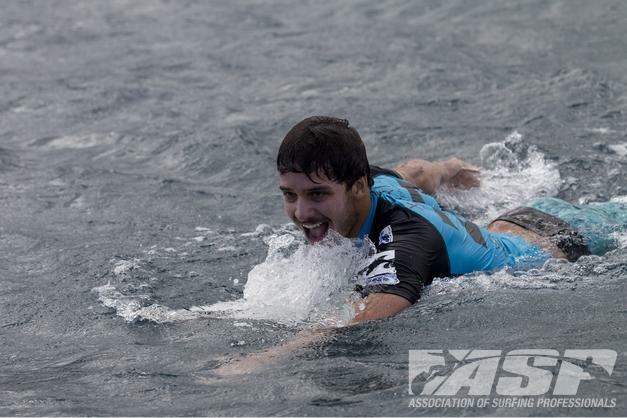 Ricardo Santos (BRA) stoked with his win over Kelly Slater. TEAHUPO’O, Taiarapu/Tahiti – The Billabong Pro Tahiti, Event No. 5 of 10 on the 2012 ASP World Championship Tour, recommenced yesterday with Rounds 3 and 4 being completed in rapidly-improving three-to-five foot (1 – 1.5 metre) waves at Teahupo’o. Ricardo dos Santos (BRA), two-time Von Zipper Trials winner and wildcard into the main event, caused the upset of the day in eliminating reigning 11-time ASP World Champion and defending Billabong Pro Tahiti winner, Kelly Slater (USA), 40, with an incredible down-to-the-wire performance in Round 3. Needing a major score with 10 seconds remaining in the heat, Dos Santos threaded a lengthy forehand barrel to attain a 9.87 out of a possible 10 and the emotional win. Dos Santos, after an afternoon loss in Round 4, has been relegated to Round 5 where he’ll face Taj Burrow (AUS), 34, this morning. Slater, who currently sits in second position on the ASP World Championship rankings may see his position drop following the tomorrow’s completion of the Billabong Pro Tahiti. Mick Fanning (AUS), 31, two-time ASP World Champion (2007, 2009) and current ASP WCT No. 1, survived a tight heat against lethal goofy-footer Fredrick Patacchia (HAW), 30, in Round 3 this morning, but was able to confidently best Taj Burrow (AUS), 34, and Julian Wilson (AUS), 23, in this afternoon’s Round 4 heat. C.J. Hobgood (USA), 33, former ASP World Champion (2001) and current No. 12 on the ASP WCT rankings, is one of the most respected Teahupo’o surfers on the planet and the Floridian goofy-footer proved why today with solid wins in Rounds 3 and 4 to advance directly to the Quarterfinals. Jeremy Flores (FRA), 24, last year’s recipient of the Andy Irons Forever Award, continued to show the world that he is one of the preeminent tube-riders on the planet taking down Heitor Alves (BRA), 30, this morning and then punctuating the afternoon by posting the event’s first Perfect 10 for an incredible no-hands backhand barrel. Despite the impressive performance, it was a rampaging Joel Parkinson (AUS), 31, who steamrolled through to an impressive Round 4 victory over Flores and Damien Hobgood (USA), 33, with the highest heat total of the round, a near-perfect 18.23 out of a possible 20. Joel Parkinson (AUS) winning through to quarter final 3. Parkinson has advanced directly to the Quarterfinals of the Billabong Pro Tahiti. Gabriel Medina (BRA), 18, competing in his first ever Billabong Pro Tahiti, proved that he is one of the most comprehensive young surfers on the planet in collecting the event’s second Perfect 10 in the final heat of the day, an incredible forehand drop into a bowling barrel at Teahupo’o. Medina advances directly to the Quarterfinals. The Billabong Pro Tahiti will culminate today. Event organizers will reconvene this morning at 6:30am to assess conditions for a possible 7am start. Surfline, official forecasters for the Billabong Pro Tahiti, are calling for a much larger, long period South swell for the day with easing winds. When competition resumes, up first will be wildcard Ricardo dos Santos (BRA) up against Taj Burrow (AUS), 34, in the opening heat of Round 5.